District cooling is refereed as a centralized production and distribution of cooling energy. Basically, a district cooling system (DCS) distributes cooling capacity in the form of chilled water or other medium from a central source to multiple buildings through a network of underground pipes for use in space and process cooling. As a result, these buildings don't require their own chillers, air conditioners, boilers or furnaces. District cooling is becoming more and more relevant as the need for clean cooling increases worldwide. In Europe alone, 40% of commercial and institutional buildings have cooling systems and that demand is growing. At the same time, CO2 reduction is high on political agendas. Because of its combination of renewable and surplus energies, district cooling emits significantly less CO2 than conventional cooling systems and emits no hazardous refrigerants. And also the DCS is an energy-efficient air-conditioning system as it consumes 35% and 20% less electricity as compared with traditional air-cooled air-conditioning systems and individual water-cooled air-conditioning systems using cooling towers respectively. In some countries that have substantial heating demand, the plant can also be designed to supply hot water to form a District Heating and Cooling System (DHCS). How Does Its Works ? 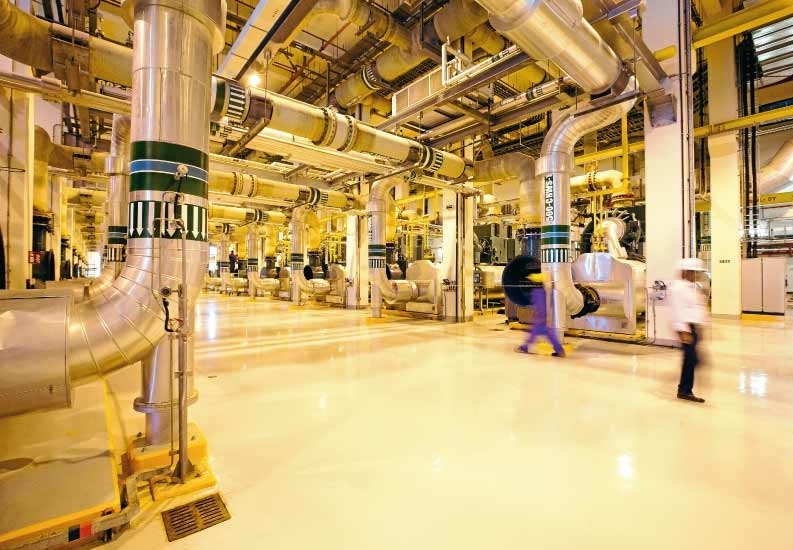 The challenges for building owners and industrial process manufacturers to keep their occupants comfortable and their processes running at the right temperature are great. Capital and operating costs, reliability, flexibility and environmental sustainability are just a few of the considerations they face.District cooling systems are a highly efficient way for many owners and manufacturers to effectively address each of these challenges while meeting their comfort and process cooling and heating needs. 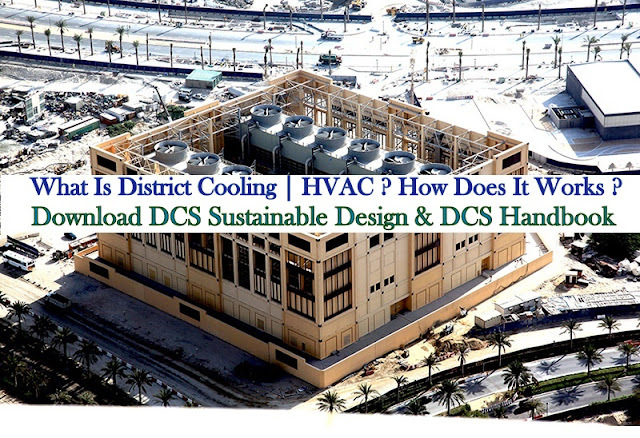 As we read above that the District cooling system (DCS) distributes thermal energy in the form of chilled water from a central source to multiple buildings through a network of underground pipes for use in space cooling. The cooling or heat rejection is usually provided from a central cooling plant, thus eliminating the need for separate systems in individual buildings. District cooling system is known as District heating system when used for heating in colder countries. District cooling or heating systems are widely used across the globe. 1. The central cooling plant. 2. The chilled distribution network. 3. The consumer system or Use Station. The central plant generates chilled water with compressor drive chillers or absorption chillers. Large size centrifugal chillers with higher efficiency are usually installed to take advantage of the economies of scale. Apart from energy efficient chillers, the central plant consists of chilled water pumps, cooling towers with condenser water pumps, thermal energy storage tank, electrical power distribution system and control system for centralized automation and control of equipment. District chilled water is distributed from the cooling source(s) to the user stations through supply pipes and is returned after extracting heat from the building’s secondary chilled water systems. Pumps distribute the chilled water by creating a pressure differential between the supply and return lines. The interface between the district cooling system and the building cooling system is commonly referred to as user station.The consumer system consists of heat exchangers, tertiary circulation pump, chilled water piping in buildings, AHUs and the air distribution system. A user station is required in each user's building to connect the DCS distributed chilled water pipe to the building. Inside the user station, devices called heat exchangers are installed to transfer heat between the chilled water supply of DCS and the air-conditioning system of the user building. The user station could be designed for direct or indirect connection to the district cooling distribution system. With direct connection, the district cooling water is distributed within the building directly to terminal equipment such as air handling and fan coil units, induction units, etc. An indirect connection utilizes one or multiple heat exchangers in between the district system and the building system. What are the benefits of a DCS? Guaranteeing chilled water tariffs and performance to End-users. Reducing overall electricity infrastructure cost and capital expenditure. Reducing operational and maintenance costs. Increasing reliability and efficiency by a 24/7 professional O&M team. 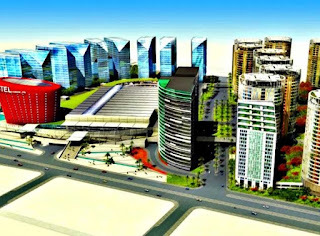 Enhancing real-estate net space and urban landscape. Allowing building managers to focus on core business. 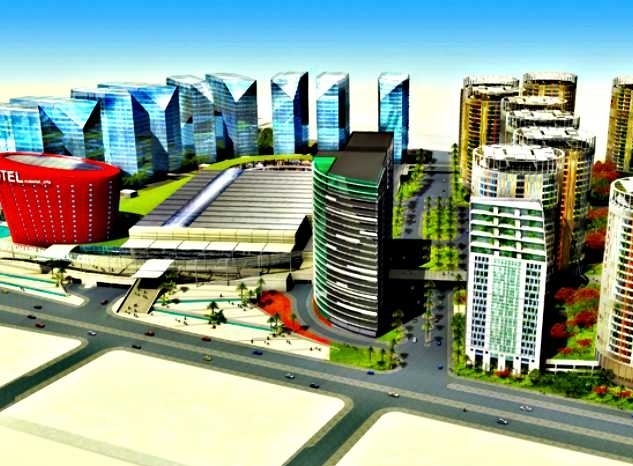 Overall, the implementation of a DCS scheme benefits to End-users, Governments, Master Developers, Real Estate Developers and the Community as a whole.